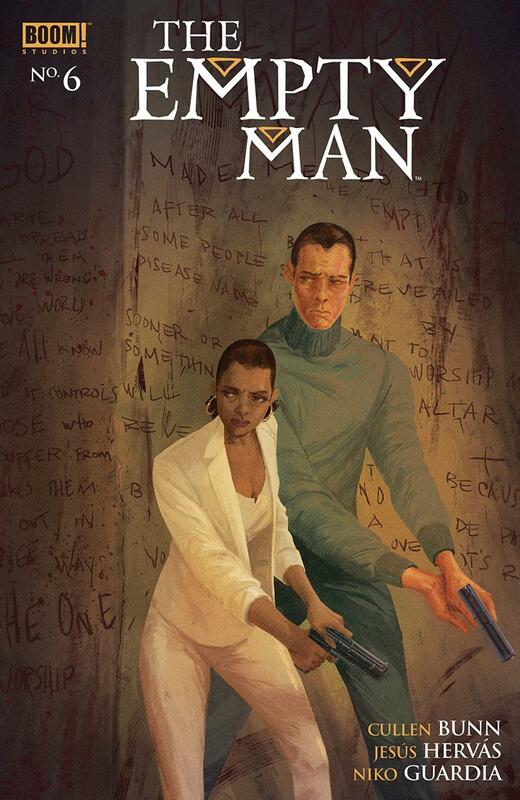 The Empty Man (2019) #6 is the definition of an excellent horror comic book. This incredible issue is shocking, disturbing, and action-packed, all of which Cullen Bunn is a master at creating. His writing talent and Jesus Hervas’ artistic talent shine very brightly in this sixth issue. It is quite impressive that Bunn was able to use this issue to progress the story while also filling it with some very unsettling scenes. There are many exciting and creepy moments in the issue, but it never stops Bunn from also revealing more of the complexity of the story to us. We get more information while also gathering more questions. This process is what has had me excited for every new issue of this series. I have used several reviews of comic books written by Cullen Bunn to rave about how much I love him and his writing, but in this review, I’m going to mostly write about the artwork. Cullen Bunn’s writing is amazing in this issue, for sure, but honestly, Jesus Hervas’ artwork may be the highlight of The Empty Man (2019) #6. Those disturbing moments written by Bunn could have fallen flat if a lot of other artists had tackled it. But Hervas’ art style is comprised of this haunting, bizarre characteristic that sets itself apart from just another horror comic book’s visuals. It is so incredible that even the moments of the issue that weren’t blatantly shocking had a very eerie vibe that consistently gave me the creeps. I can only go on about the visuals of this issue for so long without also mentioning colorist Niko Guardia’s work as well. His coloring enhances Hervas’ illustrations by giving them the sinister look that makes them stand out so much. His use of red in the backgrounds, as blood splatter, or anything else bring the issue’s visuals a whole other level of evil. This sixth issue is a pure and fantastic horror comic book full of everything that makes the horror genre proud. The Empty Man (2019) #6 is a constant disturbing thrill ride full of gore and drama. It very well may be the best issue that the rebooted series has released so far.